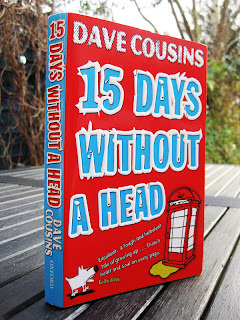 Today is officially publication day of '15 Days Without A Head' by Dave Cousins, published by Oxford University Press. You may remember me raving about this book when I read it last year. If not, please click here to read my review. 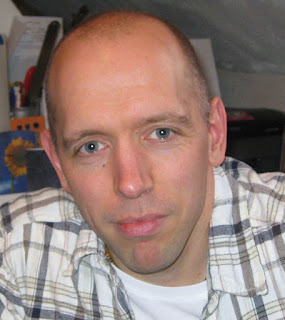 I am over the moon to be hosting the third stop on Dave's blog tour and I was lucky enough to get to interview him again. Here is the interview where Dave tells us about his hopes for publication day as well as more information about his book. Hi Dave, Thanks for coming on my blog again! It’s good to be back, Viv! Today is officially publication day. How are you feeling? Relieved, excited, exhausted … and if I'm honest, a little bit nervous. It seems a lifetime ago that I started writing 15 Days Without a Head with no thought that one day it might actually be published. So, it’s great to think that today the book will finally be in the hands of readers. You know how much I loved 15 Days Without A Head but I am curious. How many scenes were taken out of the book that you would have loved to have kept in? To be honest – none! I enjoy the process of editing and am always amazed and delighted how a book comes to life when all the superfluous words and scenes have been cut away. Having said that, there were a family with a dog that featured in a very early draft, but were cut when I completely rewrote the second half of the book. I liked them as characters, so there’s a chance they might crop up in their own story sometime. They actually get the briefest of mentions on page 159 of the book. How did you come up with such an interesting surname as Roach for your characters? That came as a result of one of those magical moments when separate elements in a story suddenly connect. I started the book by placing two brothers in a run-down flat with cockroaches in the kitchen. I thought I ought to do some research on roaches, and when I discovered they could live for days without a head, it was one of those light bulb moments. I knew I had my title and thought it would be fun to give Laurence the surname, Roach. As the story developed, I realized how apt this name was, considering the theme of survival running through the book. At one point Laurence actually said: “I’m a Roach, a born survivor!” though the line didn’t make the final edit. For me, Jay was one of my favourite characters, but which was your favourite character to write about? It was Jay actually. I had the most fun with him. I enjoyed thinking up humorous ways he could make things difficult for Laurence – like forcing him to play Scooby-Doo in public. I like the relationship between the brothers, it was the driving force behind the book, so I enjoyed writing the scenes where they were together. I have to say, I wouldn’t want Jay as a little brother though. The book deals with some very hard hitting issues. How did you research these to make them so authentic in detail? Most of it was imagination. I tend to start by imagining and using my own experience, and then go back and check authenticity with an expert. A friend of mine put me in touch with a children’s social worker who was kind enough to read parts of the story. Her feedback was incredibly useful for making sure that procedures were correct, but also in terms of the details – the social worker checking the fridge had food in it, for instance. It was important to me that she felt the book was an accurate portrayal and did justice to a situation that unfortunately many children find themselves in. According to the National Association for Children of Alcoholics, there are an estimated one million children in the UK affected by parental alcohol problems. If the book was picked up by a TV production company tomorrow (which I am definitely rooting for), which actor would you like to see playing the part of Laurence? That would be great – and fascinating to see someone else’s interpretation of the book. I don't know many actors of the right age, so I’m probably not the best person to cast the role though. Ollie Barbieri who played JJ in series three of Skins, might be good; or Daniel Roche from Outnumbered and Just William – he’s a good actor and would be the right age by the time anyone got round to filming! The person would have to be tall enough though, as Laurence is over six feet! The scene in the book, where Laurence wears a dress is hilarious. Did you have to act this out to gain authenticity? Ha ha! As you know, I sometimes use that scene for readings, so I get asked this question a lot. The answer is yes! Though I did tell my wife first, so she didn't catch me trying to struggle into her clothes and wonder what I was up to. I rely on a mixture of imagination and experience when writing. You can't have first hand knowledge of everything you write about, in fact there are things I've struggled to put into a story because they are too close to my own life. On the other hand, having done something yourself, does give you those extra details that your imagination would never supply. Finding exactly how awkward it is to put on a bra for example! The scene mentioned above was one of my favourite ones in the book, but which scene did you enjoy writing the most? That's difficult! I remember vividly the scenes I struggled with and had to revise many times, whereas the ones that flowed easily are less fresh in my mind. The scene when Jay attacks the trees with his stick – the way it weaves into what Laurence is doing at the time – I remember being pleased with that; and the scene with Mina in the café was fun. The thing is, if I’m not happy with a particular scene, I tend to rewrite it until I am! What books do you like reading? I read almost exclusively teen and YA novels – not because it’s my job, but because I think that the best writing and stories are found on those shelves. There are certain authors whose books I’ll buy every time, people like Keith Gray and Julie Hearn, Frank Cottrell Boyce … but I'm always on the look out for new books. I like interesting story ideas and a unique voice, something that tugs at my heart or makes me laugh. I love it when a book is so good it floors me, though as a writer it can be a bit deflating. You just have to think, maybe if I keep trying, I'll write something this good one day. Lucy Christopher’s Stolen was one book that knocked me off my feet last year. Superb! Will you be doing any book signings to promote the book, and if so where will you be visiting? I'm off on a week of school visits soon and have a provisional date for a book signing in my local Waterstone's, to tie in with more school visits in March. I'm hoping to get out as much as possible to meet readers all over the country, and have a number of things lined up. I’ll be posting event dates and information on my website as it becomes available. Last time we spoke, you mentioned you were presently working on your second book, Waiting for Gonzo. How far have you got with that? I'm happy to say that I've completed the early drafts and it’s now with my editor. I know the manuscript still needs some serious revising before I get it right, so I'm looking forward to getting on with the next version. I'm really happy with parts of it already though, which is good. I've also got two new stories jumping up and down for attention, but until Waiting for Gonzo is finished I have to resist the temptation to think too much about them! Thanks for having me on Serendipity Reviews again, Viv, and for all your support for 15 Days Without a Head. It’s much appreciated. Thank you for taking the time to come and join us again. I know alongside my readers, we wish you all the best with your publication. Fab interview, really looking forward to reading this one. Great interview. lol about the research with the dress. Blodeuedd, I fear that piece of honesty may haunt me for some time to come!